Insulating joist-type roof-ceiling between the ceiling and sheathing. 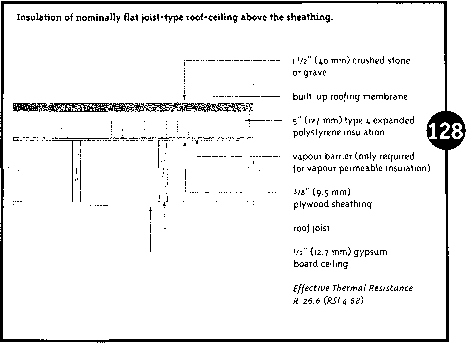 Alternative method of insulating joist-type roof-ceiling between the ceiling and sheathing. 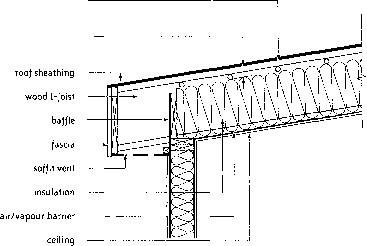 This method can be used where the slope is at least 1:6, the joists run in the same direction as the slope, and the ventilation space is continuous from eave to ridge and is vented in both directions. leaks through imperfections in the air/vapour barrier is not dissipated but accumulates and condenses. Measures to prevent this are shown in Figures 126 and 127. 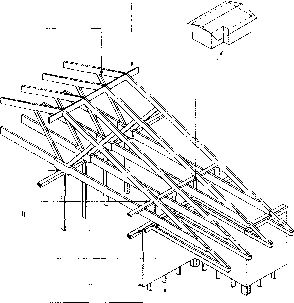 Another approach to avoid condensation problems in joist-type roof-ceilings is to place the insulation above the sheathing, as is commonly done with flat roofs (Fig. 128).